Dress up a cheap cut of steak with this tangy sauce. 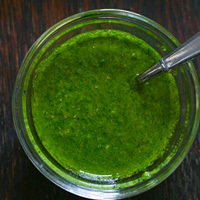 Combine cilantro, garlic, vinegar, oregano, cumin, and red pepper flakes in a food processor. Pulse until fine.